Meet San Antonio Church of Small Things author and Big Mama blogger Melanie Shankle at Barnes and Noble (San Pedro Location at 321 NW Loop 410) on Thursday, October 5 from 7-9 p.m. A percentage of proceeds from Barnes and Noble in-store and online purchases on October 5th will be donated to SAReads. Please support SAReads by presenting this coupon to a cashier at checkout, or by using Book Drive ID 12230710 online. The bookfair includes Cafe and Music Department purchases! Melanie has written three nonfiction New York Times bestsellers including Sparkly Green Earrings: Catching the Light at Every Turn, The Antelope in the Living Room: The Real Story of Two People Sharing One Life, and Nobody's Cuter Than You: A Memoir of the Beauty of Friendship. 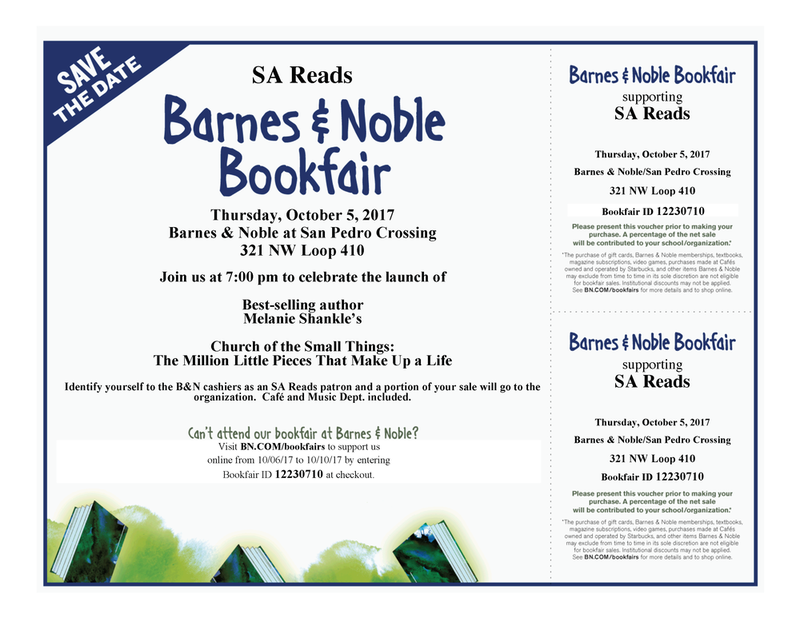 Present this coupon to your Barnes and Noble cashier or online on October 5th and a percentage of your purchase will be donated to SAReads! NW Loop 410 location only.